ST. GEORGE – Nevada rancher Cliven Bundy was a featured speaker at the Independent American Party’s summit Saturday. While he touched on matters of what he saw as government overreach and abuse of power surrounding the standoff between his supporters and federal agents, he also focused on what he called “the spiritual part” of the event. Media and the Internet have expressed some of the “physical part” of the standoff, he said. The spiritual aspect hasn’t been touched on much. “Most of you know about the standoff. That’s where we the people faced the guns of our United States bureaucracy,” Bundy said. The standoff occurred on April 12 between members of the Bundy family, their supporters and agents of the Bureau of Land Management. That morning, a support rally was being held at the Bundy Ranch in Bunkerville, Nevada, during which Clark County Sheriff Douglas Gillespie arrived to tell Bundy and others that the BLM was ceasing its cattle gather. Up to that time, the BLM had been overseeing the collection of Bundy’s cattle and any others roaming across the 600,000-acre Gold Butte area that had been closed to grazing. Though the BLM planned to leave, citing safety concerns, it didn’t plan on releasing around 350-400 cattle it had collected and was keeping at a temporary site in a wash running under Interstate 15. The BLM’s keeping the cattle, which were originally slated to be sold at auction, didn’t sit well with the rancher and his family. 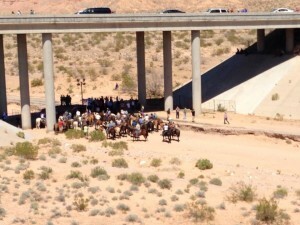 This led to members of Bundy’s family riding on horseback to the wash to demand the release of the cattle while others drove down I-15 to the same location. The Bundys and supporters in the wash ended up having guns pointed at them by federal agents who ordered them to keep their distance. Video released by documentary filmmaker Dennis Micheal Lynch, who was in the middle of the standoff, shows members of the Bundy family and others kneeling in prayer and asking for protection before going to the wash. The standoff ultimately ended without any shots being fired, the cattle eventually being released, and the BLM leaving the area. Those who went to the standoff had a glow about them when they returned, Bundy said, and those who didn’t go looked gray to him. While those who went to the wash initially did have weapons pointed at them, some Bundy supporters, among whom were members of out-of-state civilian militia groups, were also armed. However, they evidently positioned themselves away from the group pressing toward the fence that separated them from the cattle. Before the standoff, while Gillespie was on a platform talking to Bundy at the rally that morning, the rancher uttered the now famous demand for the sheriff to disarm the BLM and other federal agencies. The call expanded to sheriffs across the county during a press conference two days later. The Nevada rancher continued, saying he wasn’t a prophet, though he believes strongly that God was with his family and supporters during the standoff and continues to be as they move forward. I doubt that any supreme power would care about a group of blowhards in rural USA. volts hit Amon Bundy three time in a row, he did not go down. Anyway…. I believed in the result so much I didn’t even take a weapon. How many people have you ever heard of that just take a Bible To a Gun Fight? someone needs to commit this guy to a psych ward. “And there was a great murmuring among the Bundyites. And Cliven the great spake and proclaimed ‘Give unto Obama what is Obamas, unless it is the chosen cattle, who shall graze freely, above the laws of man”. Wow. That is rich. It should be added to the good book. Is he a prophet yet? Lol, good one! Isn’t it amazing how God conveniently sends messages to those “holy” men in Utah who believe they don’t have to follow the laws of the Constitution they proclaim to cherish? Bundy is from Nevada. And who is disobeying the constitution any more than the government itself? The Nazi’s also were convinced that god was with them and directing them. Cliven Bundy didn’t go the wash, yet he’s trashing those who didn’t go?? What, no mention of his asking where the “black folks and brown folks” are? This man is full of courage, strength, faith and pride. He is proud of his country and of his forefathers who fought and died for us -we the people- to be free!! We aren’t free anymore people WE ARE SLAVES to the government. Wake up and realize that without men like this we get walked on day after day. Bundy must have gotten his spiritual inspiration before the Ten Commandments were invented and when it was okay to steal. It’s amazing what happens when you think you’re above the law. Bundy needs to be flushed for the … that he really is, if you can find a toilet bowl large enough to contain him and a plunger to help push him on way to his rightful place on this earth, a large cesspool. It’s hard to understand how anyone can believe in this person who has proven himself to be a liar, tax evader, government hater, racist and overall idiot. Does the Mormon Church agree with Bundy on this? It is easy to find various scriptures and quote them…. A mere parlor trick unless it is backed up with good thoughts and deeds. what was this nut job doing in Saint George in the first place? Its public knowledge that he breaks and thinks he is above the law. probably in a compound with a bus buried below it. God told me I shouldn’t pay my taxes too but the IRS has more power. So Bundy…and his little “Stand Off” Every body was armed. Did the cops go in there and tear gas those folks? It was not a “Peaceful protest” it was a “stand off!” So how is this guy allowed to keep ensuing violence. Get a bunch of unarmed neighbors together in Ferguson,Missouri (black people) and its to much for law enforcement, call in the National Guard! Its 2014 we need to RISE UP TOGETHER AS ONE COLOR! Matthew 22:20-21″… “Render therefore unto Caesar the things which are Caesar’s, and unto God the things that are God’s.” That means pay your taxes! Obey the law of the land! God does not condone stealing – even for the “greater good.” Bundy is a fool. And is being fooled by an entity that is pretending to be God… like most of the folk in southern Nevada and Utah.